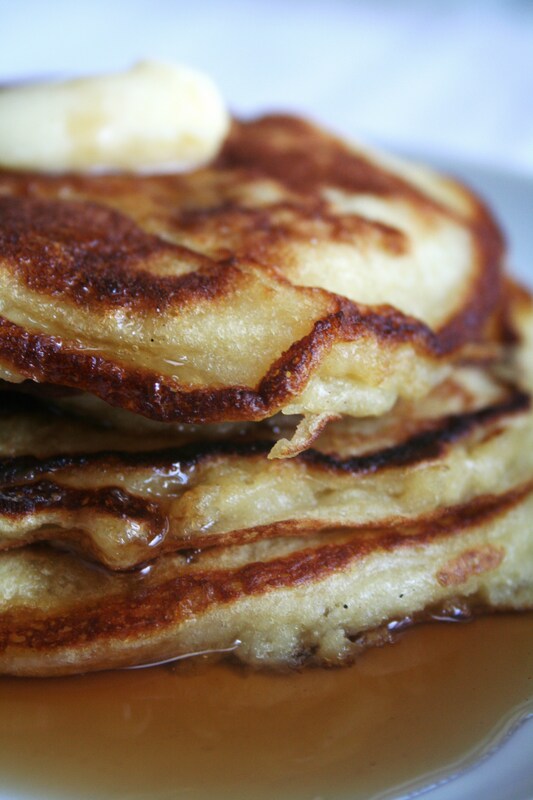 The second I spotted these babies scrolling down the Tastespotting pages I instantly knew I had a pancake weekend ahead. It’s been too long. Way too long. But I’ve never really got the pancake-thing together, so I need some time to recap between each batch. But now, it’s on. Me myself and a another pancake recipe! I particularly liked the light slightly golden colour, not to mention the thickness. They were thick, I tell you. Seriously obese. Mmm, obese pancakes. I’m not sure that sounds that good after all. But you get my point. Just take a look here. I actually had another pancake recipe on my to-bake list, involving bananas, but this one made it to the top of the list immediately. Besides, I should probably get the basics together before experimenting and going bananas, and since this one’s called Classic Buttermilk pancakes, there was no doubt about it. And I had some buttermilk about to expire. And I’ve had a rough week. It was so meant to be. My main pancake problem is getting them nice n’ fluffy. They just won’t fluff. And I like my pancakes real thick. I followed the instructions precicely to get the result as seen on the web. I wanted that fluff. The key, is to let the batter rest for a while, allowing it to thicken as the flour absorbs the liquid and swells. 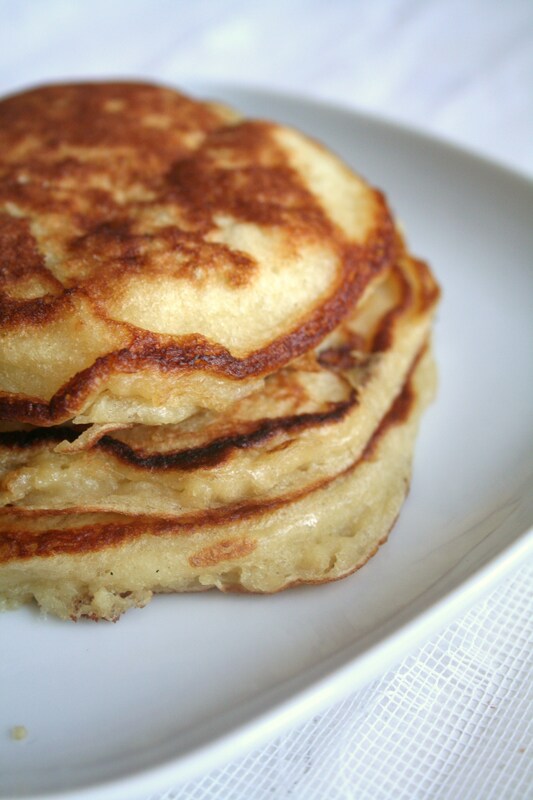 This makes a pancake that rises more and that is far more fluffy and light. And that’s exactly what we want! Heat the oven to 200°F/100 C.
Melt the butter in a small bowl in the microwave or in a small saucepan on the stove and set aside to cool briefly. In a large bowl, whisk the flour, sugar, baking powder, baking soda, and salt. In a medium bowl, whisk the buttermilk and eggs. Pour the wet ingredients into the dry ingredients. Whisk gently until the dry ingredients are almost incorporated; stop before the batter is evenly moistened. Add the cooled melted butter and mix just until the batter is evenly moistened (there will be lumps). Let the batter rest while you heat the griddle. Heat a griddle or a large skillet over medium heat until drops of water briefly dance on the surface before evaporating. Lightly oil the griddle. Working in batches, pour 1/4 cup of the batter onto the griddle for each pancake, spacing them about 1 inch apart. Let cook undisturbed until bubbles rise to the surface and the edges look dry, 1 to 2 minutes. 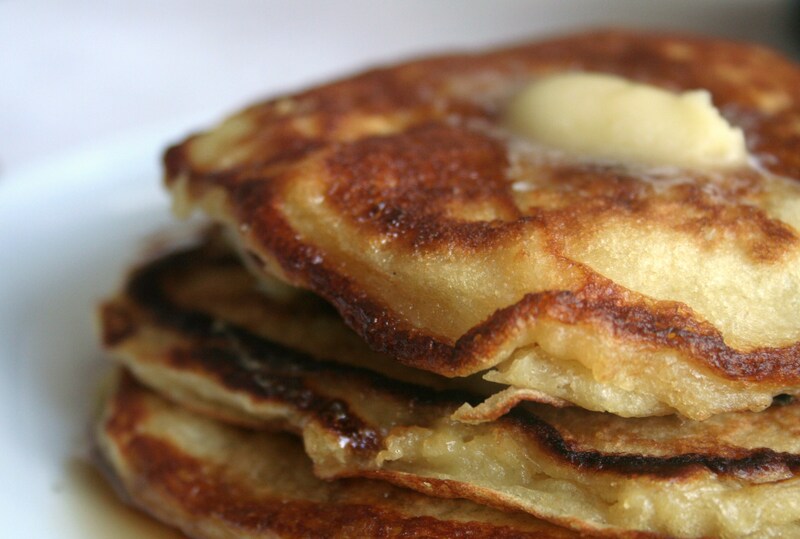 Check the underside of each pancake to make sure it’s nicely browned; then flip. Cook until the second side is nicely browned, about 1 minute more. Transfer the pancakes to a baking sheet and keep warm in the oven while you repeat with the remaining batter. The result did not disappoint. Though they didn’t quite look like the picture. But, do they ever? I guess you have to snap the photos once they’re ready to get that look. Flip them over with one hand, snap the photos with the other one. But I’m not that pro. Or well cooridnated. They sank together, loosing some of their airyness when I removed them from the griddle, but the taste – their inner beauty – made up for it. Oh la la! The best pancakes of my life! Seriously. They were just delicious. You need to try them. Serve them hot with butter, sugar and maple syrup. Lots of it. I promise you, there’s no better way to start off your weekend! Don’t you just love any excuse to have cake? Legally cake, how can you resist? I tend to find reasons to celebrate with a cake a bit too often, any reason to whip up something sugary and sweet is a good reason. So needless to say – Valentines is cake day. This year it turned out to be the same day as mother’s day and lent. Puh! I couldn’t get around to do all the required things like buying my mother flowers, making her cake, making traditional fastelavnsboller, spending some quality time and food with my man in one day alone. I don’t multitask very well. Priorities had to be made. I spent the saturday in my sister’s house, and my parents came over for breakfast on Sunday. So I got to see my mum. Check! Later when we got home I did some reading and we went for a walk. We passed the bakery and thought of buying fastelavnsboller, or just plain buns and put them together with cream and jam at home. After all it was lent. But we decided to make buns next weekend instead. So again, check! Mother’s day and Lent was taken care of, only V-day to go. Foodwise or any-wise, actually, we didn’t really have any plans for the day. But suddenly hunger hit us and we had to go out. Neither of us was really in the mood for cooking, and I got a sudden craving for mexican food, so we went out and I had a delicious veggie quesadilla. Ok, I’m blabbing, and this seems to be going nowhere, but the thing is, on our way home I suggested to make chocolate fondant for us. 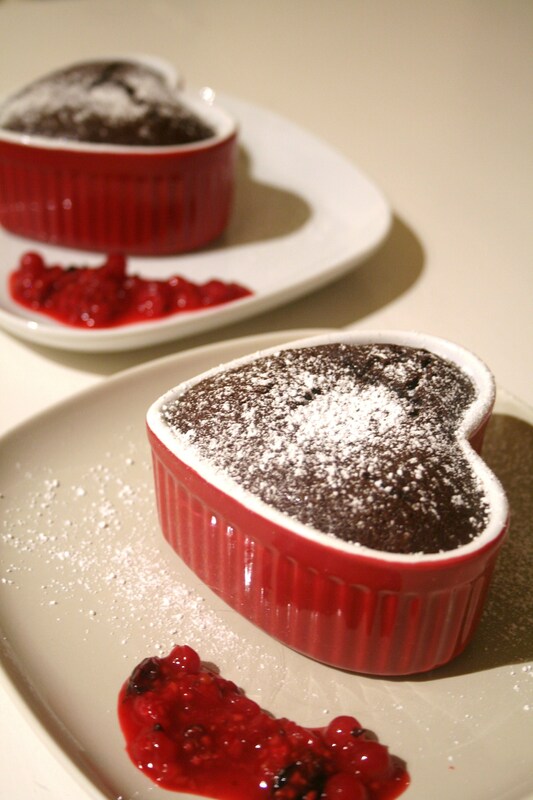 What better day to put my cute heart shaped ramekins to use! 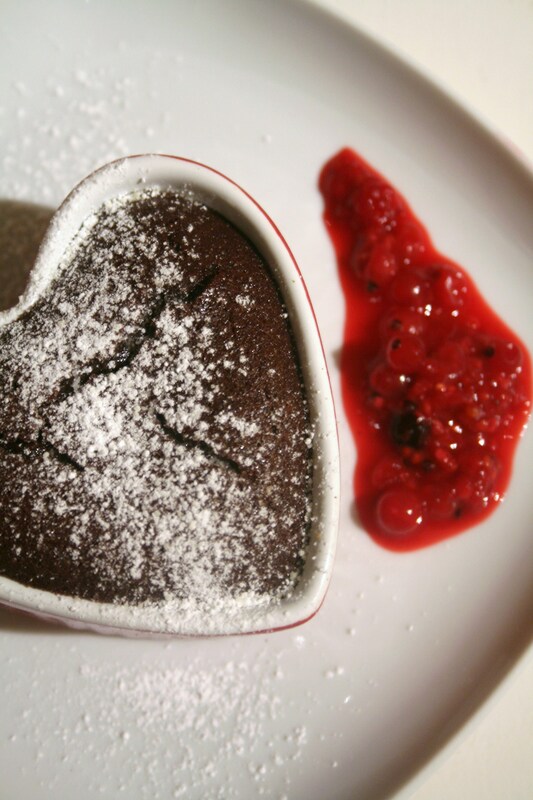 My boyfriend, not to say myself, loves anything chocolate, especially lava cakes. To say this was a special Valentine treat for him or us – well, it would be a lie. I make this a little more often than I like to admit. Not every single weekend, but at least once a month. But it’s soo good! And it’s soo fast! And it looks quite impressive with very little effort, that’s always a plus! I never get tired of it. Hot chocolate goo oozing out of a baked chocolate exterior? I rest my case. Preheat oven to 425 degrees F/ 200 C. Spray 6 -6 ounce ramekins or cupcake tin. In a medium microwavable bowl, melt chocolate chips and butter in the microwave for 60 seconds and then in 30 second increments until smooth (about 1.5-2 minutes total). Add flour and sugar to chocolate/butter sauce. Stir in the eggs and yolks until smooth. Add vanilla and coffee liqueur/instant coffee and mix everything until combined. Divide the batter evenly among the each cups. Place cups on top of a cookie sheet and bake for 10 minutes. The edges should be firm but the center will be runny. Run a knife around the edges to loosen and invert onto dessert plates or you can serve each molten lava cake still in the cup. Normally I just eat it straight from the cup, but then again, I make this a LOT. There’s usually no occasion other than a chocolate craving. But sprinkled with powdered sugar, a dollop of whipped cream or ice cream added or some red berries, this is a sure way to anyone’s heart. Valentines day or not. First of all let me give you a warning. 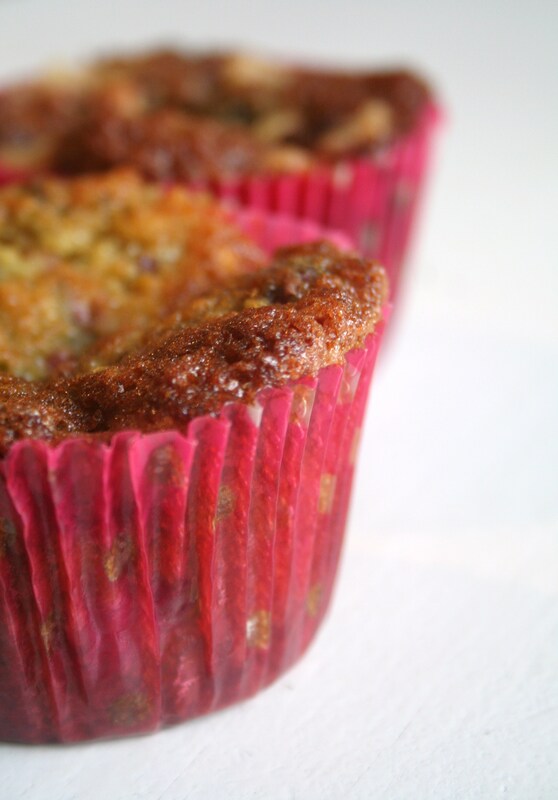 These muffins are not for the faint at heart. I repeat, not. But they are dangerously tasty. Like most bad things are… Still interested? Thought so! This is actually a TWD recipe, or Dorie Greenspan anyway. But originally it’s a crumble cake with blueberries. I made that about a year ago, (blog post here), and fell in love. Oh my. It was so sinfully good! That thick buttery crumb. The moist cake, and the berries. What’s not to love? Did I mention the buttery crumb? Yes I did. Anyways. My sister called me this morning and invited herself and her daughter along with my mother on a visit today. So I saw this as a great opportunity to remake this wonderful creation! I cannot be trusted alone with goodies like this, so when 3 girls were coming my way, I thought I could push some of the calories onto them. Not that I’m the calorie counting type. I mean, take a look at the recipe. But like I said, me and cakes? Just the two of us? I see trouble. I see myself becoming fat in a near future. Center a rack in the oven and preheat the oven to 350 degrees F. ( 175 C) Butter an 8-inch square pan and put it on a baking sheet. To make the cake: Using your fingertips, toss the berries and 2 teaspoons of the flour together in a small bowl just to coat the berries and set aside. Whisk together the remaining 2 cups flour, the baking powder, baking soda, salt, cinnamon and nutmeg. Working in the bowl of a stand mixer or in another large bowl, rub the sugar and zest together with your fingertips until the sugar is moist and aromatic. Add the butter and, with the paddle or whisk attachment, or with a hand mixer, beat the sugar with the butter at medium speed until light, about 3 minutes. Add the eggs one by one, beating for about 1 minute after each addition, then beat in the vanilla extract. Don’t be concerned if the batter looks curdled – it will soon smooth out. Reduce the mixer speed to low and add the flour mixture and the buttermilk alternately, the flour in 3 parts and the buttermilk in 2 (begin and end with the dry ingredients). You will have a thick, creamy batter. With a rubber spatula, gently stir in the berries. Scrape the batter into the buttered pan or muffin forms and smooth the top gently with the spatula. Pull the crumb mix from the fridge and, with your fingertips, break it into pieces. There’s no need to try to get even pieces – these are crumbs they’re supposed to be lumpy and bumpy and every shape and size. Just scatter the crumbs over the batter in a more or less even manner. Bake the very low caloric cake for 55 to 65 minutes, (muffins for 25-30 minutes) or until the crumbs are golden and a thin knife inserted into the center of the cake comes out clean. It might seem underbaked, but if the crumbs are golden they should be ready. 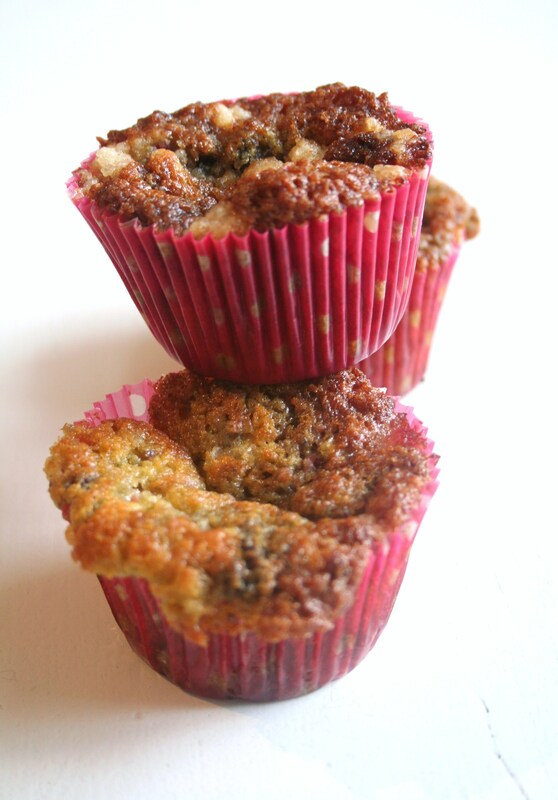 My muffins felt very runny, but I had to take them out not to burn them. But if you have the willpower to let them cool for a bit, they will be perfect. Firmer but deliciously sticky. We ate them with a spoon… Transfer the cake/muffins to a rack and cool just until it is warm or until it reaches room temperature. Like all good coffee cakes, this needs nothing but coffee. But seeing my niese drinking milk with it, I guess that works too. The point is, you have to neutralize them. It’s best served the day it is made, but if you should be lucky enough to have anything left, it can be wrapped well and kept overnight at room temperature. For you to enjoy the next day. As breakfast, lunch, for coffee or dessert with a scoop of ice cream. Anything goes with these babies. Fridays have lately become my vegetarian day. My boyfriend’s off to play football, so he’s not eating dinner. Which leaves me alone with the ever so hard desicion – what to have for dinner. But somehow it’s a lot easier when it’s just for yourself. You don’t have to make a proper dinner – unless you want to – and of course, you can toss together whatever you like without having to compromise. And I quite often have to, as does my boyfriend, since our dinner preferations are very unlike. He needs meat. I need veggies. He likes traditional. I like modern. So when I make dinner for myself only – I opt vegetarian. And light. Most often a salad or something. I don’t need that meat. But last week I bought a pack of soba noodles and decided to make something of that. 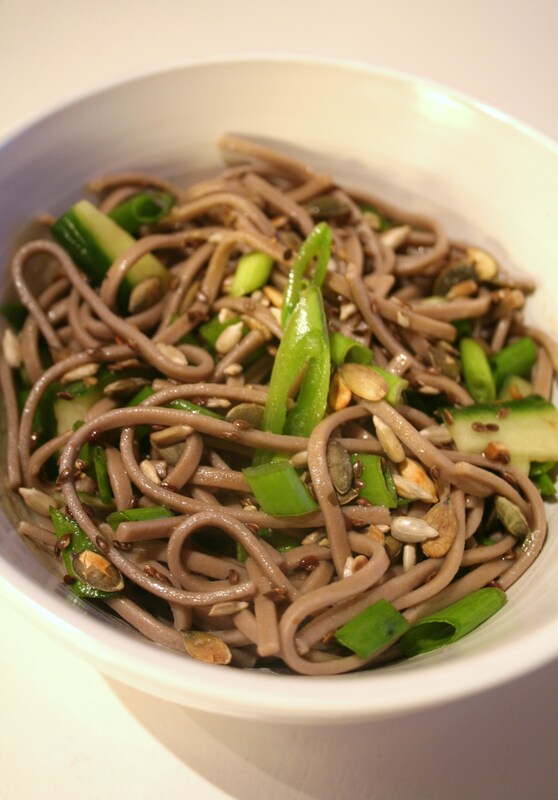 I’m a big Nigella fan, and in her book Forever Summer there’s a recipe with soba noodles that I’ve been wanting to try ever since I got the book. But until now, soba noodles have been impossible to track down in this city, so I more or less forgot about it. But only more or less. You can never really forget a recipe that gets to you. Especially with a picture and Nigella’s description along. So today was the day that I finally could give it a try! Since this was my dinner I added some sugar peas and cucumber as well. And I replaced the sesame seeds with sunflower and pumpkin seeds. I’m glad to say it was perfect. Luscious cold sesamy flavoured noodles. With crispy green vegetables and roasted seeds. Perfect solo dinner, I must say. (Whereas my boyfriend would have considered this as an appetizer.) But he’s gone. I’m here, and I’m satisfied. Serves 4 as part of a meal – or 2 when eaten as they are. Toast the sesame seeds in a dry pan over a high heat until they look golden brown, and tip them into a bowl. Bring a large pan of water to the boil and add some salt. Put in the soba noodles and cook them for about 8 minutes (or according to packet instructions) until they are tender but not mushy. Rinse with cold water until the noodles have cooled. 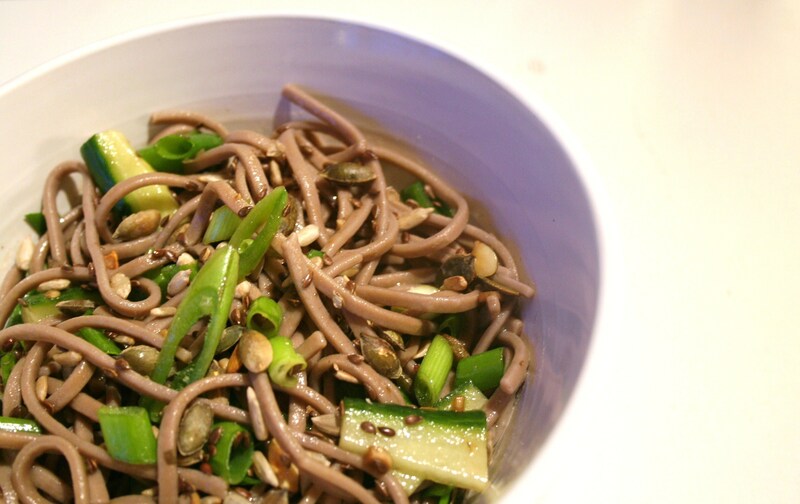 Leave the sesame seed noodles for about half an hour to let the flavours develop, although this is not absolutely necessary or sometimes even possible according Nigella. And I agree. Not necessary. Not possible. I’ve been waiting for this long enough! There hasn’t been much blogging or baking lately. I realize that. I’m just trying to eat my way through our pantry and our freezer, before I fill it up with more stuff. 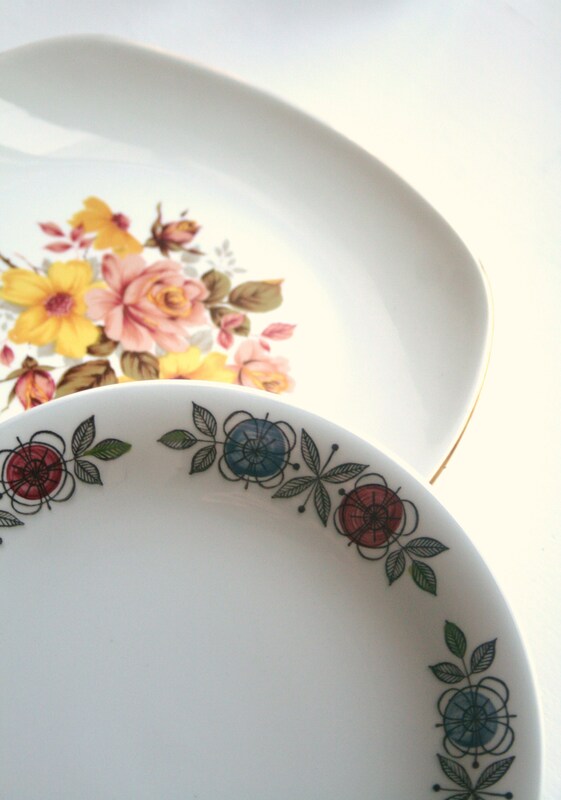 But now that I have these beautiful new plates, I have to put something onto them soon. I was at the salvation army shop yesterday. And I don’t think I’ve ever entered that shop without buying something. There’s always something. Most often – a lot of things. I love second hand shops, flea markets and the salvation army shop. It’s so much more satisfying finding something there than in – let’s say – IKEA. Not that I don’t love Ikea, but when you find something in a second hand shop, it’s so much more personal. You feel grateful and lucky for finding that one special item, and hold on to it like it was your baby. Well, maybe you don’t, but that’s my shopping style, anyway. I’ve been to one too many flea markets. That’s what 9 years in the school band does to you. It’s in my blood. My dna. I’m becoming one of those who lines up 2 hours before it opens, with my knitting, pushing my way through the queue running like a maniac to the kitchenware… No, I’m not quite there. Yet. Anyway. Yesterday was no exeption. I found two beutiful plates that I just had to have. Especially the flower-printed one had my name on it. And raised in a flea market, I know to turn the plate to see where it’s made and what it is. And this was Figgjo Flint. My favourite! 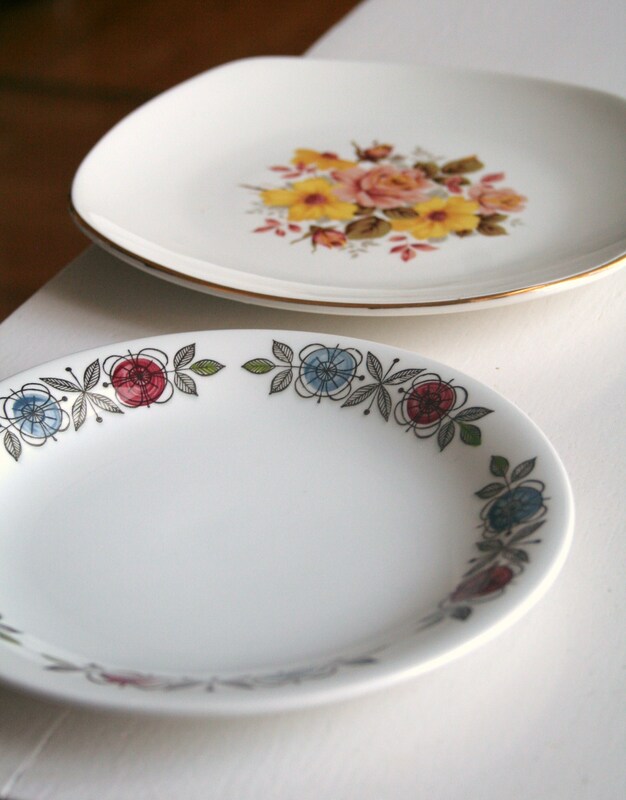 A Norwegian porcelain company whose older/retro products have become very popular. The other plate was Swedish. Don’t remember the name, and I’m too lazy to get up. Besides I bought a pack of napkin rings. Brand new! So next thing: food. I promise. These plates – filled with something – are coming to a blog near you. Soon.